Mothers’ Day weekend was chilly. In fact, it was downright cold on Sunday. Especially after a gorgeous lead-up, with sun and warmth and sun… And blossoms. Lots of blossoms. 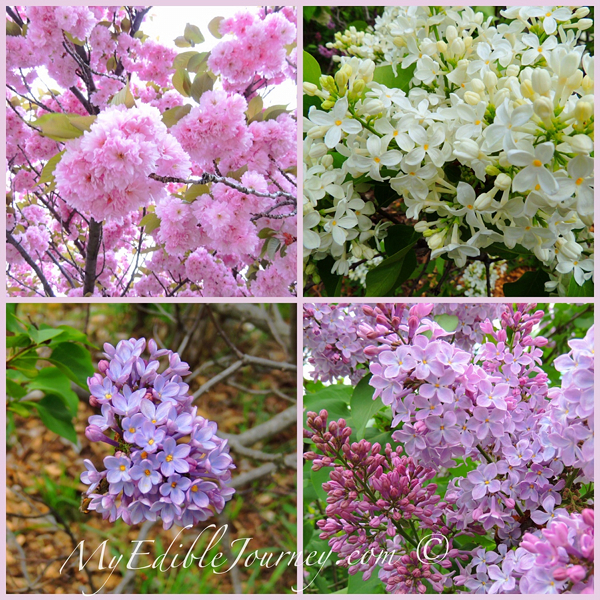 Every year we head to the lilac garden in Niagara Falls. It’s one of my favourite places to spend time, and it is beautiful for such a short time each year. Thankfully it was nice enough on Saturday to head out and take in the sights and amazing scents that the garden offers. I’m sure I’ve said before that I’m not a huge ice cream fan. I don’t mind it, but often the store bought stuff leaves me wanting. Especially since we’re limited to products that are peanut-free. But I like homemade ice cream. And I had a large jar of local honey that begged to be used in place of white sugar. It was too cold and windy to grill a nice steak dinner, but I could treat myself to a jazzed up ice cream. Having a base recipe like this is great, because it allows me to play around with something that I already know is tasty. I can change the sweetener (to white or brown or dark brown sugar, maple syrup, coconut sugar or maybe even molasses), add an extract, infuse a flavour into the cream, stir in yummy ingredients or swirl in a nice sauce. I added in some finely chopped unsweetened chocolate (but please, use at least bittersweet – I thought unsweetened would balance the sweetness of the caramel swirl that I added, but it just left bitter bits packed in my molars). The chocolate sauce helped. Whisk together the egg yolks, honey and salt in medium bowl; set aside. In a medium saucepan, bring the coconut oil (if using), heavy cream and half-and-half to a full simmer*. Remove from heat. Slowly whisk 1 cup of the simmering cream mix to the egg-honey mixture. This is called tempering, and it prevents the eggs from getting too hot too fast and scrambling. Then return the egg and cream mixture to the pot. Bring the mixture to a simmer over medium-low heat, stirring constantly until the custard gets thick enough to coat a spoon, ensuring that it doesn’t boil. Remove from heat and add any flavouring that you may be using. Adding the extract at the end prevents excessive evaporation of flavour. Use less mint or almond than you would vanilla (which I used). Strain the custard through a fine strainer, to catch any egg bits that may have coagulated. I forgot, and it was fine. This time. Cover the top with plastic wrap and refrigerate until cold (at least 3 hours and up to 1 day). Freeze the mixture in an ice cream maker according to manufacturer’s directions. At this point, you can add things. Soft ingredients, like fruit, should be added about half way through freezing and chunky ingredients, like nuts and chocolate get added during the last 2 to 5 minutes. Transfer to a bowl or tub, add any desired swirls and and freeze until firm—at least 3 hours and up to 3 days. *If you want to infuse the mixture with a flavour, like whole vanilla beans or tea leaves (Chai, Earl Grey, etc), add them now and leave the mixture to steep for a couple of hours in the fridge before straining and bringing back to a simmer and proceeding. The recipe for the chocolate sauce that I poured over the top can be found here. 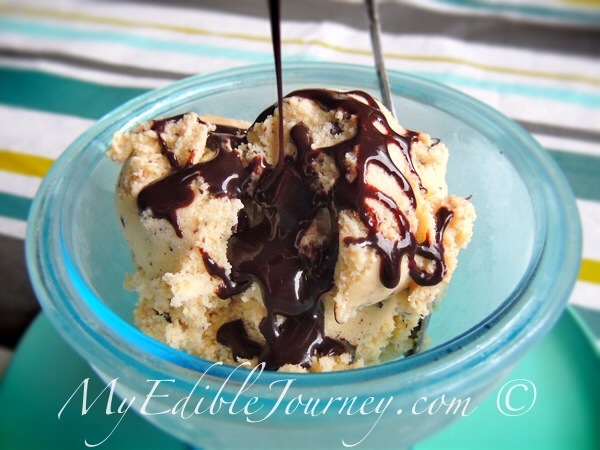 This entry was posted in Desserts, Ice Cream and tagged chocolate, dessert, honey, ice cream on May 15, 2013 by Mama B.
I happen to LOVE ice cream!! My ice cream maker rarely gets put away from May til October. Thanks for sharing this awesome recipe. You’re quite welcome. 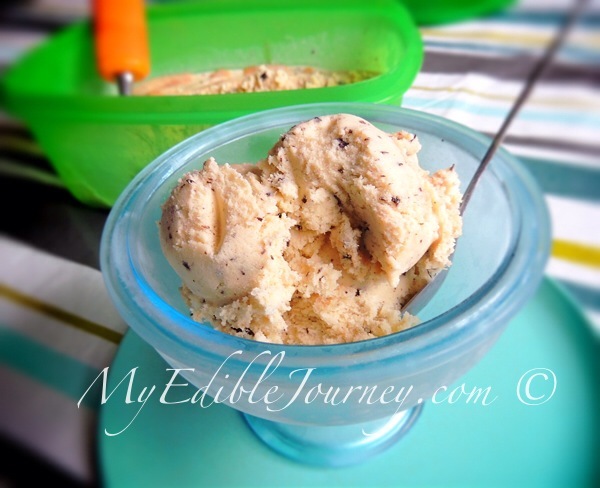 I love making ice cream, so I’m sure there will be more recipes coming as the summer goes on.